Park of the Caprice. Yes, we know it is a bit far away but, doesn’t it deserve a visit to start a much more happy life? Its lush gardens will inspire the less skilled and it will be the perfect scene for this decisive moment in your life. But avoid “rush hour” (it is open on weekends only) or you’ll have public -desired or not- for your proposal. The Gardens of the Museum of the Romanticism. An unknown place for many Madrilenians, this garden has even a small café that will help your feelings to arise and will transfer you into the 19th century surrounded by a unique and incomparable environment. Of course, you don’t need to wear like a Medieval knight, jeans and sneakers are just ok. Don’t miss the museum, where you can find inspiration -or not- for the furniture of your new home. Rooftop terrace of the Circle of Fine Arts. Do you like heights? Well, then this is your perfect place for a proposal while you and your fiancé stare at Madrid from the air in an almost 360º view. This terrace, recently renewed, has also a restaurant and a bar where you’ll have the opportunity of drowning your sorrows with a good Gin Tonic if necessary or celebrating your success with the best aerial views of this marvellous city. What are you waiting for going up a jump into your future (not literally, please)? Sunset at the Temple of Debod. Nothing best that taking a blanket, preparing a picnic basket with a good wine and some cheese and being prepared for one of the most romantic dates you will ever have. The environment of the Egyptian Temple of Debod, perfectly well illuminated and reflected on the water that surrounds it, while the sun is setting on the vast West, will turn your visit into a romantic explosion of passion. 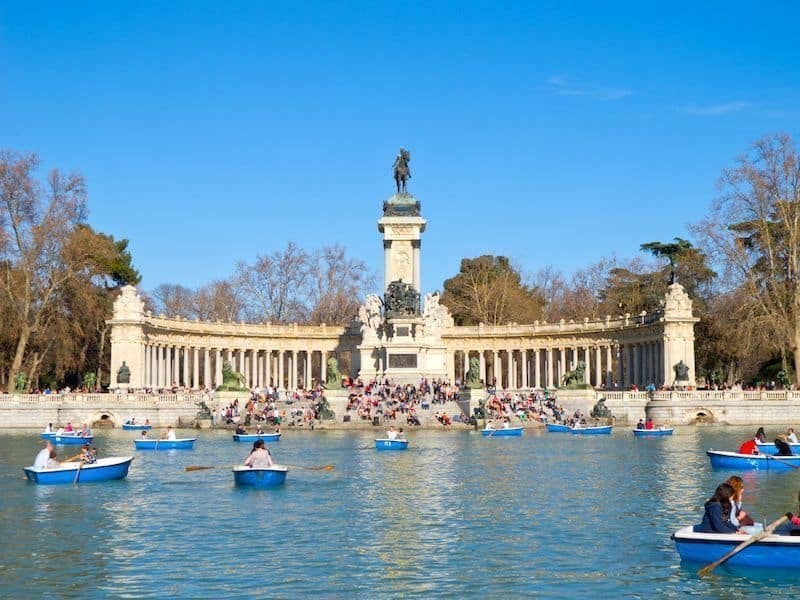 The Big Pond of the Retiro Park. Yes, we know that rowing is not your best and that you have been training at the gym during the last three months for this moment. The Big Pond is the best place to show your efforts while you propose. It’s a big lake surrounded by trees -and of some passer-by feeding the carps- in which you will have the opportunity of hiring a boat and explaining your fiancé how important she/he is for you accompanied by the romantic sound of water. If you choose a weekday to propose it will be a cheaper and less multitudinous experience. A ride on the cable car. Another scene on the height, but this time inside a cabin, which makes it more intimate and inviting. That’s it, you have incredible views of the Casa de Campo, the Royal Palace and the Cathedral of the Almudena and ten minutes ahead in which you’ll have to captivate he/she. If you fail, we are sorry to have to tell you that you’ll have another ten minutes for returning. You can also go down at the Casa de Campo and look for another less permanent agreement. The Gardens of Sabatini. These unknown and quiet gardens (nobody goes down the stairs from Bailén street just to avoid going up again) has a central pond, on whose surface you can see the façade of the Royal Palace reflected. You’ll have to choose one of the stone benches that surround the pond and, accompanied by the sound of the fountains, you’ll surely reach your objective. Don’t forget to finish your proposal with a stroll along Cuesta de San Vicente down to the river, where you’ll put the best end to the most romantic evening ever. The Rose Garden at the West Park. This suggestion is only for the period between May and July, unless you’re a botanic lover and sprouts inspire you the most romantic words. 20.000 bushes with 500 varieties of roses are comprised in this Rose Garden. Choose the less pointed rose bush and declare your unconditional and eternal love with a colourful background. But ask him/her about allergies first, we don’t want you to end up at ER. The garden of the Prince of Anglona. Shhhh!! Don’t tell anybody, but our favourite meditation place when we are unable to concentrate at the office is this garden. Why? Because almost nobody knows it, it is small and bushy and it is at one end of the Plaza de la Paja, where you will have also the opportunity of having a drink to celebrate the proposal. The garden was designed by a French designer back in the 18th century and it has granite benches that will help you to find a comfortable position in order to have success. But don’t say it in the social network or everybody will discover our secret! In a restaurant. For the most traditional of you. Which one would we choose? Any restaurant in which you have a contact at the kitchen that can help you to personalize your proposal. Forget hiding the ring or the watch inside a cake, because the dentist bill can be more expensive than the present. In our blog you’ll find a lot of ideas for good restaurants in which you’ll find a private table to get your triumph. Get lost in Madrid and declare your love! The best city to do it in the world!